Most pieces of music have a musical background which supports the melody. This background is usually put together from the notes of the chords in the chord sequence, played in a predictable rhythmic pattern. In piano playing, the left hand usual plays this ‘accompaniment pattern’. 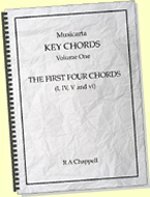 Being able to devise accompaniment patterns from chord symbols is essential for the successful modern keyboard player. Here is the Module audio performance, which plays some of the treble patterns you’ve learnt previously over the accompaniment pattern you’ll be learning in this module. The Musicarta Canon Project is now available as an e-book digital download and on CD-ROM. These skeleton Canon Project web pages are being left on the internet as an expanded Table of Contents, so you can see how much you’ll benefit from purchasing the Canon Project. To give you the best chance of evaluating the Musicarta Canon Project, you can download the MIDI files for these free-to-view Canon Project web pages. File reference numbers are shown, where applicable, in the right hand audio player table cells. To play your MIDI files, download MidiPiano here. Learn more about MidiPiano on the Musicarta MidiPiano page. You can also play the MIDI files as basic audio in most media players. Pachelbel’s Canon is in the key of D major scale. Click through here for a thorough D major refresher course. Click back to the Canon Project home page here. Click back to the Canon Project TOC page here. 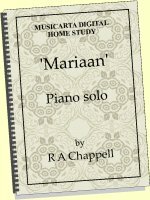 Root, fifth, octave, tenth accompaniment patterns are universal in popular music and a time-honoured stand-by in solo piano textures from classical to jazz. Try it yourself! Once you start playing proper two-handed Canon arrangements (or any other self-accompanied music) your accompaniment pattern has to be practically ‘automatic’. 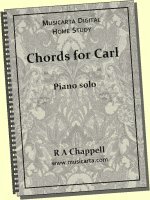 You have to know your accompaniment pattern chord tones for all six Canon chords ‘just like that'. That’s why the Canon Project takes you back a step and introduces this universal accompaniment material two hands first. Musicarta’s tried-and-tested drills take you beyond copying and teach you this popular keyboard texture in a way that will enable you to remake it a dozen different ways down the line – an excellent up-front investment of your time and effort. If you know somebody else who is also working through the Musicarta Canon Project, or are working through the project with a teacher, you can use this module’s two-handed bass accompaniment pattern as the bass (‘secondo) part of a Canon duet. The other player (‘primo’ – the top part) can play any of the treble material from the previous modules. Sample duet music is included in the Canon Project download. If you loop one of the backing tracks included in the download on Audacity (Musicarta’s recommended audio editor), you will be playing the module audio performance. Thanks for visiting MUSICARTA! Come again soon! Get an overview of Musicarta in manageable monthly slices – and keep up to date with new postings. © Copyright R A Chappell/Musicarta.com. For private study use only.